If you’re responsible for marketing a small business online, then you’ll no doubt know just how tough it can be. Sure, you’ve paid for a well-designed website and you’re plugging your products and services social media, but are you generating the results you want? And is the time and effort involved in digital marketing really paying off for your business? If the answer is no, then there’s another marketing technique that you should consider. That technique is content marketing. Simply put, content marketing involves you creating content, whether that’s a blog post (the most common, with more than 2 million blog posts published a day), a video or infographic, and using that content to promote your business. Below, we’ve rounded up just some of the reasons why content marketing is essential. 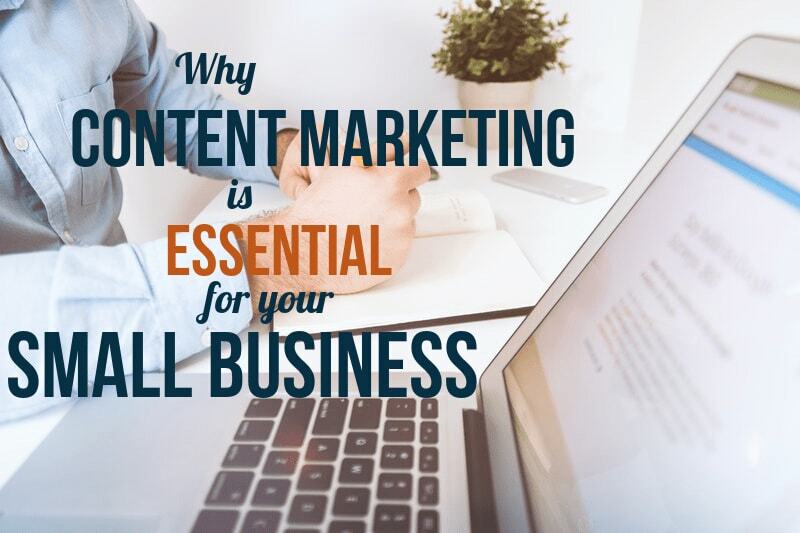 There’s no doubting the benefits of content marketing for small businesses. Not only do you get to position yourself as an authority within your niche, but you get to create relationships with your readers and use those for promotional purposes. So it’s little wonder why your competitors are spending their marketing budgets (or marketing time) on writing quality content that helps them rank on Google. And so the longer your competitors are writing content without you following suit, the further behind you’ll be when you get started. … and speaking of search engines, content marketing can help. If you’re producing quality content on a regular basis that answers your visitors’ questions and provides value, then search engines like Google will reward you for it. Every time you publish a new blog post or YouTube video, you’re giving Google a new piece of content to crawl and index on their site. And the more posts and pages you have indexed, the more of your pages will rank, and the more organic traffic you’ll get as a result. With this organic traffic, you can promote your products and services through calls to actions and inside of your content marketing, which gives you the potential of scaling your business and generating sales without having to depend on pay-per-click or social media advertising. That’s why content is so effective. Although content marketing has exploded in recent years, with more posts being published than ever before, there’s still probably a gap in the market for content related to your niche – and your customers are crying out for it. Try to identify exactly who your customer is, get to the bottom of their challenges and problems, and produce content that helps them on their journey. Doing so will position your business as an authority and give people a reason to keep coming back – even if they’re not ready to buy from you just yet. If you run a hair salon, for example, then you could create content that’s centred around new hairstyles and fashion trends. If you’re a mechanic, you could create in-depth tutorials on how to complete car maintenance, like filling up your oil or checking tyre pressure. There are endless opportunities to create high-quality content that answers questions and offers genuine value to your customers, so find your niche and decide what to write. Content marketing is the key to a successful sales funnel, and so publishing a new piece of content on a regular basis should help you to generate new organic traffic and push people into signing up to your mailing list, taking part in a free software trial or handing over their contact information for you to use at a later date. Just check out this piece from Curata, which put together ten of the best examples of content marketing from B2B brands. If you’re writing content and can’t seem to get the results you’re looking for, then try to optimize your call to action and create a more compelling offering. It may be that you have to give away a free eBook, a free trial of your services, or run a competition to capture the attention of potential customers. Doing so through your content will net results. Nobody said that writing content was easy, but the best way to improve and become a content marketing expert is to just do it. Do your research, experiment with different content formats and see what works for your business and your niche. Good luck!